9/3/18, Review by KyleSmith - Overall, this course is worth playing, especially if you can find a deal online. The greens are perfect as usual- quick and true. The fairways had some spots throughout the course, which is pretty typical from what I have experienced. Tee boxes were pretty decent, although I played the tips for the first time and they don't get as much use. This course plays completely different from the tips- multiple 200+ yard carries and different angles when you have to hit driver. Still a fantastic course. Worth the trip. 7/28/18, Review by GolfNiners5 - Course is in great shape, greens were slow and you could tell they had been punched within the last couple of weeks but hey rolled true. My main complaint and reasoning for not giving it 5 stars was the pace of play. They piled people up even though they had a starter. We waited pretty much on every hole and probably every shot. It had to be the longest round of golf in my life. They have 3 to 4 rangers driving around but they don't do anything to speed people up. If I wasn't playing so well we probably would have quit early. 6/27/18, Review by Shankapotomous - I stumbled on this website recently and I firmly believe in first hand reviews. So since I play often and everywhere, I thought this might be helpful. First of all ... if you have not played Red Bridge or its been a while, do yourself a favor and go again. In terms of public courses in Charlotte, Red Bridge is absolutely one of the best I have played. It starts at check in with a first class staff (Mark Davis - Head Pro) is always extremely helpful and attentive. And it goes through the grounds crew who do a great job with the course. This truly is a hidden gem. It is always in top notch shape and is a true test to your game. The greens are very smooth and well manicured, and the fairways are green and great turf to hit off. The seeding of the course is consistent and flush and green throughout. The rough is fair and plays consistent hole to hole. The bunkers are well maintained and fair to hit from (actually true playing sand .... not the dirt or hard pan many courses have). There are 2 greens (12 and 15) which had small winter kill which is being addressed and rectified by the grounds crew. These greens were aerated and top dressed and are recovering appropriately, and they do a good job of placing the pins where you can still play the greens fairly so keep an open mind and be glad they are doing everything they can to have those back in tip top shape soon too. Several holes have some newly laid sod which seems to be a proactive course improvement to areas before they became an issue (so kudos to the grounds crew and staff for being proactive and not reactive). Weekday rounds (pay at the counter are roughly $35 but if you pay online you can get them as cheap as $25 in some cases). Pace of play is what you would expect and the course is a great mix of dog legs left and right, and is made up of 5 par 5's, 5 par 3's and 8 par 4's. All of which play tough but fair. All in all, if you haven't played here .... you are missing out. Do yourself a favor and go play Red Bridge and take a few friends as well, you will not be disappointed. This really is a hidden gem around the area. 4/29/18, Review by jscum13 - Almost every tee box was dead. Dirt or significant issues but you had to search for grass in order to put a peg in the ground. Greens were fast, very fast...and true but half the greens were suffering from significant poa disease and it was thick and prevalent around the greens making the Texas wedge almost impossible. Red Bridge is usually in good shape but judging by the reviews on this site, it appears April hasn’t been a good month for the public tracks. Course was very dry too, fairways thin and spotty and need the heat really bad. 4/14/18, Review by The B-Man - I have to caveat this review with the fact that I shot my career best tying round (76) - lol. I actually told my dad during the round that if I shot my best score, I would take on an extra half star to my review. The other caveat is that Red Bridge has literally been my favorite public course in the area for the last several years. So I have high expectations around here. I have to say though that it is not in the best shape right now. The bermuda greens are blotched with poa annua - really badly on the front 9, not so much on the back. It does affect putting on about 1/3 of the holes. Talking to the staff, they acknowledged it would be a few weeks before the poa annua dies off as the bermuda wakes up and starts growing again. In addition to the greens, the tee boxes were badly torn up and many were bare dirt. The fairways were very thin and at least one (#8) was littered with weeds. So the course is showing some neglect in addition to the poa annua. That was disappointing to see -- this course is usually in tremendous shape. I got a very good deal online ($26 for a 2pm Saturday tee time) so the value was certainly there. Pace of play was slow but we were warned that a large outing had teed off about 45 minutes before we did. The issues I listed didn't significantly affect play (though we allowed everyone to move their ball on the green if there was poa annua in the immediate direct line). I just expected better. With the score I shot, I'll be back of course :-P, but I'll probably wait at least a month before I consider it. 4/6/18, Review by jaydee - Tee boxes / areas are pretty rough shape but not a real concern for me. Greens in good shape, some irregular areas thought but course in great shape for early April. Got a deal on GolfNow, at $20 each I'll play this course all day. Both me and my wife always enjoy course. 4/29/17, Review by Drewpac - Greens were in great shape. However it looked like the many areas of the course had not been mowed. Pretty much just the greens and surrounding areas were the only areas that were consistently mowed. Was hard to find balls even if barely in the rough. They're also suffering with large amounts of poa annua in fairways. Great track, but would like to see them have a bit better maintenance on a beautiful weekend day. Maybe last week's rain had to due with the struggles on the grounds side. Hopefully it is resolved. 4/17/17, Review by KyleSmith - This course never fails. Its in great shape and the greens are the best in the area that I have seen (although I hear Mooresville and Monroe CC are great right now too). Well worth making the trip out, and I believe its the best value golf in the area. 3/7/17, Review by dad4204 - Red Bridge was in good shape, Fairways coming in, greens in good shape and rolling true. Bunkers the best I've seen this year, unfortunately for me. I like Red Bridge for the variety of shots you must make, even though I didn't make them this time. 11/6/16, Review by KyleSmith - I have heard alot of good stories about this course. Finally played it and can not wait to go back. The greens were amazing, multi tier and plenty of grain. If you can read these greens, you are a good putter (or play here way too much). As a long hitter, I liked having to take iron off of alot of tee boxes. Really mixed up my game. By far my favorite feature on this course was the bunkers. I dont know that Augusta has bunkers this fluffy. Its like hitting from a cloud. Absolutely can't wait to go back. This is now my favorite public course in the area. 10/4/16, Review by dad4204 - I really enjoyed Red bridge today. Tee boxes were fine, greens really good, I don't read them very well so I can't comment on that. Fairways good, both sand traps I was in were really good, plenty of sand and fluffy. You can't beat $22 Tuesday, but it's worth the regular rate for sure. I played the gold tees. 9/30/16, Review by TPX - Always love this course. The staff can be quirky to deal with. Was in really good shape today, greens pretty much perfect and the rest of the course as well. *PSA*-avoid buying snacks/drinks here. This course has always been reasonable on rates, but $1.50 for a pack of crackers and $3 for bottled drinks is ridiculous. 8/14/16, Review by ShooterMcGavin71 - Fun course. Lots of variety. Anything left above hole was lightning fast going down. Putting green faster than course greens (grrr) Pace of play was kind of slow - didn't see a ranger until 14th hole. 8/7/16, Review by metallikviper - The course is in perfect shape. I really wish this course was not so far away. Tee to green the course is in great shape and the layout is very challenging. Virtually no issues to report. I would definitely recommend this course. 3/9/16, Review by GetThere214 - Was able to get out on a great Wednesday afternoon and course is in good shape. Tee Boxes were good. Fairways were fine for the time of year. Bunkers were very good and taken care of. Greens were very good. Rolled a little slower then I am used to here but ran pure. Overall in very good shape for the winter and looking forward to coming back. 9/6/15, Review by GetThere214 - Golf course was in great shape. We were one of the first groups out on Sunday morning. Tee boxes had some wear and tear because it seemed like they did not move the tee areas from the previous day. But there was still plenty of areas to tee up without a problem. Fairways were very good. Rough was good but very thick in some areas. Was a difficult shot out if you got caught in it. Bunkers were good. Greens were very good. Extremely fast from above the hole. Overall a great course and round of golf. 8/27/15, Review by ILL-INI - I'd have to give this course a 5-star if it weren't for a few goofy pin placements and a few spotty tee boxes. The greens were tight and rolling true, the fairways were plush, sand is fine. Pace of play today was lightning quick which I guess is to be expected during the day on a weekday. The $13 tee time was through golf-now - actually it was $10 if not for the $3 golf now fee - couldn't believe it when I saw it. It was for a one-person tee time though, which makes a little sense. Either way, a complete steal for the money. I wish this course were a little closer to my house, I'd play it way more often. Right now is a good time to book a tee-time though, course is in phenomenal shape. 7/8/15, Review by panthersfann55 - Greens were fast and tough. cups cut on slopes killed our group. Always a good test off golf. my only complaint is the fairways being cut so tight. with a steep downswing my club bounced all day. 6/29/15, Review by The B-Man - Back at my favorite course for the first time in a while. This is the best conditioned public course I've played around town this year. The greens were immaculate, all of them rolling true and quick. The bermuda greens don't show too many marks but there were a few that needed to be tamped down as lazy golfers weren't fixing them. Tees were very good. Fairways were also very good, but there may have been one or two (#15 comes to mind) that still had some thinness or dead areas. Bunkers were raked and dry. I got out for a Clickit deal at $27 and the course was pretty empty at 5:30. I got around in under 3 hrs. I can always count on Red Bridge for a great round at a great price and this was no exception. 6/15/15, Review by scrillthedeal13 - Great Golf Course. Booked on GolfNow for $18 and teed off around 4pm. This course was in great shape tee to green. I'm honestly surprised that this course doesn't get more play than it does, but it is kind of out of the way. I really like that the course has so many par 5's. There are plenty of chances to score out here. Check it out sometime! 6/13/15, Review by pga5f - Played early Saturday morning. Unfortunately the first group out (7 am) was on a 5+ hour pace. The course quickly became a log jam. The rangers did nothing about it until it was too late. The course was in good shape but the pace of play and the lack of attention by the rangers made it miserable. With the price getting higher ($60 including range balls), I expect more. 5/17/15, Review by MGOBLUE - I haven't played here in almost a year but it is one of my favorite courses in the area. The greens and bunkers were in perfect condition while the fairways could definitely use some rain and TLC. They were very thin, very, very firm with mixture of yellow and green grass. I guess Ft Mill Golf Club has me spolied when it comes to course conditions. 5/3/15, Review by GetThere214 - This is the second time I have played Red Bridge. Had a great time and was very impressed with the course conditions. Tee boxes were the only issue (some were pretty chopped up). Tf they were a little better would have gotten 4 stars. Fairways were nice. Course has greened up well. The real pleasure of the day was on the greens. They were in great shape. They were soft to hold a shot into them and rolled really well. Speed was really good. Will definitely be coming back. 4/24/15, Review by tvrepairex - Good conditions for the most part.Course greening up well.Greens good except for a few ball marks and pretty fast.Traps were good even, after all the rain the past week,with plenty of fluffy ,white sand.Course is challenging,but fair,just a little long for an old guy like me (63)from the white tees.My fault on that-should have moved up! 4/4/15, Review by jscum13 - Seems to be the theme of every course I've played lately. Shotty tee boxes and fairways/rough, but pure greens. Red Bridge was especially dormant from tee to green. Very quirky course. Our group hit some tee shits in the middle of the fairway and watched them run off in to hazards and ponds. Not a fan of the layout, but the pace of play was good. 1/19/15, Review by The B-Man - For my first round of the new year, I went back to one of my top 5 courses in the area. Got a great price for a morning round on a holiday for some people, though I don't think it was holiday rates. Despite the nice weather, there was apparently still a 40 minute frost delay (9-9:40) and so our tee time was pushed back about 30-40 minutes - however, the pro shop was no help with that. And there was no starter. I mighta thought they would shotgun the start or at least double tee off the back to catch. Nope... Pace of play was brutally slow for 3/4 of the round and no rangers in sight. That's all the bad news. The good news is that the course is just as nice as I remember. Greens in fine shape and very fast (downhill). Tees and fairways were dormant of course and many of the tees were bare dirt in spots, but overall I felt the conditions were good. I just wish they had managed the pace of play better. 11/8/14, Review by hotrod jb - Tee boxes ok, fairways pretty thin and turning brown. The greens are FAST!!! 10/23/14, Review by panthersfann55 - greens A+, fairways very thin, bunkers were playable, the ball will sit down in the rough buddy lost a ball 10 feet off of #7 green never to be seen again, tees were in good shape. pace of play was horrible the 2 groups in front of us were no match for the tees they played from. at one point there was 5 groups on one hole #13. Pins were in very tough spots no flat putts today. When there is an almost full tee sheet there should be a ranger roaming around the course. 10/14/14, Review by oneputt - Made the trip out to RB. It was worth every mile! The geography that the course is built on is really nice. The trees were just starting to turn their fall colors. The layout of the course was interesting. Several of the holes played rather gimmicky. The greens were perfect. They held shots nicely and the putts rolled true and smooth. Some of the best greens I have seen so far this fall. The fairways were mowed tight. Good amount of roll and overall the lies were good. Traps had plenty of sand and were for the most part dry and consistent. Tee boxes were ok. Staff was very friendly. I will most certainly make another trip soon. 9/7/14, Review by FrankGolfs - Greens were excellent, awesome day for the trip to Red Bridge. Its always worth the drive if you haven't played the course. Rolling hills and plenty of difficulty. The back tee's are brutal and you should bring your A game to play them. This is in my top 5 Charlotte area courses to play! 8/6/14, Review by nenad - Nice layout, and the golf course was in a good shape. I was playing in the early afternoon during the week so I basically had a golf course to myself. Price on golf now was 22 so it was definitely worth a travel. I would probably play this golf course more often if I lived closer. 7/3/14, Review by panthersfann55 - got caught in a down pour for 30 minutes but the greens drained well. fairways got a little sloppy in the low areas. greens still showing punch marks and the ball bounced off line a few times. fairways still thin and i don't think this will ever change due to the direction golf courses are headed these days saving water. pins were in some tough spots that I haven't seen before. 6/21/14, Review by MGOBLUE - Nearly perfect course conditions, fairways were a little on the firm side on many holes but really nothing to complain about. 6/4/14, Review by DrSchteeve - Red Bridge just surpassed Verdict Ridge for my #1 course in Charlotte. The combination of perfect conditions (fairways the best of any course I have played this year, hands down), great pricing, and great people just can't be beat. 5/25/14, Review by hotrod jb - Tee boxes are great, fairways dry and a little thin. Greens are very good and roll fairly quick. Really nice course right now. 5/4/14, Review by DrSchteeve - Let's see. Greens: perfect. Traps: perfect. Pace: 4 hours. Fairways: just a little thin, normal for this time of year. 5/4/14, Review by stint32 - Course is in wonderful shape as always. greens are the best in the area and i would say this is currently the best public golf you will get anywhere near here. Only thing is waiting on fairways to come in but other than that wonderful. 5/3/14, Review by hotrod jb - It's in really good shape. Driving range is in great shape as well. Greens are nice and quick. I think the guy placing the pin locations had a bad Friday night or something. Place was set up for a Sunday PGA tourney but still great. 3/22/14, Review by metallikviper - It had almost been a year since I played this course and it is nice to see that they are maintaining it well. Driving range, putting green and chipping area are all in great condition. Looking at all the great reviews I was expecting a pristine course, so I was slightly disappointed. Tee boxes on par threes were a little chewed up and could use some seeding. Fairways were all yellow which is expected at this time of the year. The greens definitely needed to be mowed as they were very hairy and it looks like they had just sprayed them green. The course should play nicely in the summer. 3/5/14, Review by panthersfann55 - great shape for this time of year. 12/21/13, Review by DrSchteeve - As always, perfect. 10/27/13, Review by DrSchteeve - The first time in a while that I didn't give Red Bridge perfect conditions. The reason is the fairways are thin and hard, and some teeboxes a bit chewed up. Greens perfect, traps beautifully raked, and still overall a great course at a great rate. 9/1/13, Review by DrSchteeve - Not sure if reviews of Red Bridge are needed. 7/20/13, Review by Bogey-Golf - Got a good deal online to play. Greens and fairways were good. Pretty good layout. The biggest problem was pace of play. RB decided to let a six-some...yes a six-some out midday on a weekend. On top of that they were letting two-somes out instead of foursomes. It was a cluster. The course is nice so the only way I'm going back there is on a weekday when it's not so busy. 5+ hour round. 7/19/13 - Greens are scheduled to be aerified 7/23-24. $10 off rack rate is available and numerous online specials. 7/14/13, Review by DrSchteeve - I guess the perfect should be qualified as perfect given all the rain - sure there were some spots on some fairways where you had to move the ball, but there weren't that many. 90 degree rule on 15 holes. For $32 for an 11:00 am Sunday tee time that included a free bucket of balls, just astounding. Brand new range balls, new practice chipping greens. Only negative was some slow play that wasn't rangered well. 6/12/13, Review by DrSchteeve - Wow! Red Bridge just keeps getting better. Every time I go, they have done something to improve the course. Most recently, brand new range balls and perfect range conditions, along with a chipping green with several pin placements. Greens, fairways, traps all perfect, and prices still low. 5/24/13, Review by IM4DHERD - "Perfect" is much closer than "Good - normal wear and tear". Some rough is still a bit thin, but the teeboxes, fairways and greens are in excellent shape, perhaps the best I've seen this year so far. Hadn't been to Red Bridge in perhaps a year and am very impressed with how it's grown in. Always liked the layout. 4/21/13, Review by ILL-INI - Heck of a play for $39 bucks right now. Fairways are still a tad thin but coming in nicely. Greens were rolling a little slower than normal but still very nice and rolling true. I'm happy to drive a little further to play this course, it's a nice little gem. 4/13/13, Review by The B-Man - This is the best round I've enjoyed here, not just from a score perspective but conditions and experience as well. I think the course has finally grown in -- the greens are more receptive, the tee and pin placements seem fairer, and the yardages are marked! All of those are previous complaints of mine. Today conditions were great. A few tee boxes were thin. The sand traps were just okay. Fairways and greens were great and that's what really counts in my eyes. All of the greens were consistently good, not running too slick. And as I said, the course now has yardage plates in the fairways and distances to hazards on the tee boxes. Pace of play was normal and the $39 Clickit coupon was a steal for a Saturday morning round at this course. 3/20/13, Review by JHG - Course is in ok shape. Tees and fairways are ok. Greens are good. Sand in bunkers is good. All in all not bad. Cart path only on a few holes. 3/10/13, Review by _mk70 - The course was in good shape as were the greens. The tee boxes were a bit beat up but that's about it. The real issue was the ranger. He asked us pick up our pace after 9. Nobody behind us was waiting on their shots but we picked up our pace starting on 10. Then the ranger actually sat behind our carts and watched us play 11 which we found to be very rude. Then on 12 he asked us again to pick up the pace and keep up with the 3-some ahead of us even though we had a 4-some. It turned our round from having fun, to constantly looking over our shoulder for the ranger to yell at us again. Two guys in our group shot in the low 80s so it wasn't like we had 4 hackers working our way up the course. We finished our round in 4:35 and Red Bridge's suggestion is 4:25 so we are talking about ten minutes over. The course was fun but probably won't be back for a long time due to the bad taste in my mouth from the ranger. 12/2/12, Review by DrSchteeve - Only thing less than perfect is the greens had some little tiny punch holes, but they still putted true. They really work hard to make this a nice place to play. In addition to near perfect conditions most of the time, the prices are always reasonable. 10/22/12, Review by izzyf150 - Red Bridge is in good shape still. Only a few complaints today. Tee boxes needed to be moved to a new location, most boxes were really divoted up. There were some thin fairways. Also some of the fairways were really hard. I got robbed a few times from balls hitting in the short grass on the fairway and taking wild bounces left or right. I also got some longer distance off the box on the flatter fairways but I would gladly given up the extra yardage to avoid the shots I got robbed on. Greens and sandtraps were in good condition. 9/16/12, Review by slowmofo - First time I have made the trek to red bridge. What an awesome course. Everything was in perfect shape. The mini verde greens are doing exceptionally well and they are soft. I actually spun one off the green which was suprising. I have to agree with Bman about the only thing I didn't like on this course. its that the scorecards don't show the layout too well, and you will have no idea how far the hazards are on some of the blind dog legs. This caused my score to drop as I should have pulled 3 iron on two holes instead of driver. After playing it, I will remember where to hit, but you should play with someone who knows the course the first time. 8/29/12, Review by panthersfann55 - only second time I have given a course a 5. New ownership, friendly staff, tee to green plush. Couple of bounces did not go my way which killed me on the par 5's. Sand was smooth to hit out of and looks like they are making a new tee box on 11 left of cart path on the hill. 8/26/12, Review by DrSchteeve - The previously reported sand on the greens is 95% gone. A bit of waiting on each shot but 4 1/2 hours on a crowded Sunday is not bad. 8/21/12, Review by GungaGalunga - Tee to green the course is in very good shape. I forget how many white stakes are out here (stroke and distance) luckily it was quiet and I could go back to the tee box when I needed. The layout here is good and pace is great and people are friendly. 8/20/12, Review by izzyf150 - This place is in good shape still. Only a couple of things to report. They have put down a layer of sand all over the greens giving the greens a whiteish color to it. Kind of like dew in the morning or something. The greens seem to be a touch slower with a little less break on the ball. The ball still rolls smooth but on occasion you do have to go tamp down some small clumps of sand that are on your line. Maybe some of you golf experts might know how long for the sand to soak in. By no means did it make the round less enjoyable though. Most of the tee boxes were good shape. Noticed a couple of thin fairways but not bad. Sand traps were good. 8/8/12, Review by Wulfpack - It was my first time out to Red Bridge and I really like this course. It is a bit quirky and makes you think. Must place your shots on several holes. Had to play no. 18 driver, 3-wood, 3-wood but managed to par it. It is a monster of a hole. No. 17, that dogleg right par 4 with the water got me, but other than that it was a very smooth and enjoyable round. No one was out there and I rolled on through in about 2.5 hours. Conditions were perfect, though greens seemed a little on the slow side. Must have recently punched them. Only suggestion would be to place some yardage markers out there. There are really not many at all and it is a bit frustrating considering how nice and well kept the course is. Wouldn't take much. I highly recommend this course if you can make it out there. And previous reviewers were spot on about Andy's burgers and fries afterwards. Some seriously good stuff! 7/29/12, Review by mondiablo - The course was in reasonable shape considering the heat. The front 9 greens had been punched recently, and I believe the back 9 was getting punched this week. May give it a couple weeks before heading back. Bunkers were in good shape as well as the fairways and tee boxes. 7/7/12, Review by The B-Man - I finally got back to Red Bridge after almost 2 years. Other than the routing changes on the front 9, not much has changed -- and that is good and bad. The good is that the course is still very well maintained. The mini-verde greens are in fine shape, as well as the fairways and most tee boxes. There were a few holes where the white tees were up or back (mostly up). I missed all the bunkers so I didn't notice any issues there. Also good was the new routing -- the 412 yard par 4 is a much more logical starting hole than the old one, the 129 yard par 3. On the flip side, however... I was disappointed to see the course is still not well marked. All you get on most holes is the 50 yard markers. There are plenty of sprinklers but 90% of them don't have a yardage. There's also little information on the tees about carry and hazard distances. So if you don't play here often, you can get into trouble with what you think is a good shot (happened to me on #8). I would think by now they would have yardage markers, pictures of the hole on the cart or the tee boxes, some kind of help. While the greens were immaculate in condition, I am not a big fan of the mini-verde grass. There is such a dramatic difference in speed and break on any kind of slope -- very slow uphill and almost unstoppable downhill. With several of the greens severely sloped, there are many unfair places to put the pins and I ran into a few today (front on #5, front on #10, and front on #16). I was also not pleased with the pace of play. I was a single and took 3.5 hours (most places I get around in 2.5 to 3). When I called to check before coming (~3:00), the guy had me make a tee time (for 3:44), took my name and phone number (? ), and told me they were clear for 30 minutes around my tee time. Shortly after I got there (3:30), though, not one, but two twosomes somehow get in front of me (never saw them check in). The first was gracious to let me tee off #1 ahead of them, no problem. I caught up to the second group on #3, said hello, but received no offer to play through. I was not in a big hurry so I took my time and played behind them the rest of the front 9. At #9, I hit the clubhouse for some water and when I get to #10 tee, another (!) twosome has jumped in front of me. Why would the clubhouse let them start on #10, with a single on #9? So I played the whole back 9 trailing these 2 twosomes in 95+ temps. Not fun. Overall, I still enjoy the uniqueness of the layout and find it challenging yet rewarding. I just think it is still a little rough around the edges. 7/3/12, Review by Gin Mill DJ - The fairways were a little hard from the extreme heat, but the greens were in prefect shape. Some of the holes are very similar. Alot of Dogleg rights with similar distances. #18 is a monster! 619 yds from the white tees. With a waste area/creek 30-40 yds in front of an elevated green. 6/23/12, Review by metallikviper - Probably Charlotte's best maintained course. Tee boxes, fairways, greens, bunkers almost perfect. I really like the layout of this course as it challenges you to play the smarter stroke. Some are long, some risk-reward and some just blind. If it wasn't a 50 min drive, I would be here at-least once a month. 6/18/12, Review by mondiablo - Course was in excellent shape...greens were perfect! I love this course and continue to come back again and again. Can't beat it for the price. 5/16/12, Review by DrSchteeve - Amazing recovery for the greens from punching 2 weeks ago. THere was some sand on the greens, but the holes from punching were completely gone. I thought the greens were perfect - the sand slowed the pace a little, but the lines held true. The sand bothered my playing partner but I don't know why. Fairways in very good condition - I played the ball down and had no issues at all. Red Bridge continues to amaze me with how much upkeep and improvements they continue to make. Every time I play I see several employees out on the course improving the conditions. They apparently have an owner who continues to put money into the course, and plans are for a new clubhouse in a year or so. The only bad news is that I overheard them talking about starting to charge the prices that the course really deserves - I think the $29 specials may be gone. 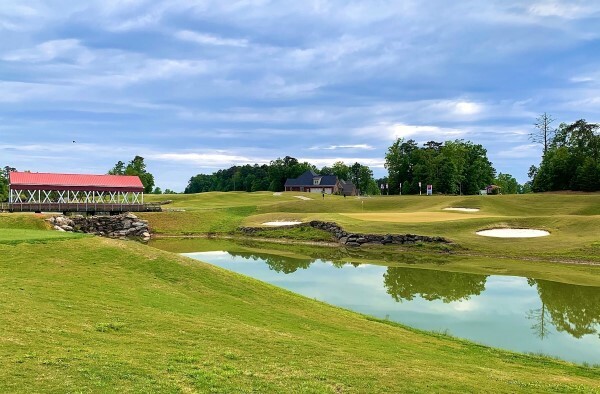 I don't care - I put this course right up with Verdict Ridge, Carolina Lakes, Olde Sycamore - and even at $39 during the week and $49 on weekends their prices are more than competitive, especially when I think their conditions are better than any of those courses. The Bermuda greens are just fantastic. 4/26/12, Review by jimmyd26 - Flew into NC from Michigan to play golf. Really enjoyed the layout. Got burned a couple times because first time playing course. Greens were tough to get used to, I'm used to playing on bent. Fairways were firm and still in spring form. Staff was nice, new owners looking to invest in course. Would definitely play again. 4/21/12, Review by Orion - The course is in fantastic shape. The aeration they had earlier has really helped. The tee-boxes are still full of holes, but everything else is smooth. The greens are in great shape also. This is another one of those really tough courses, be sure to bring extra balls just in case! We were able to get a fantastic rate through clickit, only problem is that the guy at the counter did not recognize the rate. We easily resolved it and were able to move on. I highly recommend making the drive out. 4/14/12, Review by DrSchteeve - Greens perfect. Fairways just punched with big plugs, so they are very bumpy. Teeboxes need some work. Traps were fine. All in all, decent shape and the plugging of the fairways should help conditions later on the year. pretty good for this time of year. greens were slower then normal, but still rolled true. bunkers were in good shape as well as tee boxes. green grass should be starting anytime now since the warm weather is finally back. i do like the new configuration of not starting on a par 3, but man does the par 4 1st (old sixth hole)a bear playing into the wind up hill. was a nice change of pace but will head back to eagle chase for the year. their greens heal pretty quick if they use small tines. 2/25/12, Review by ILL-INI - The greens are some of the best rolling greens out there. If it wasn't for the drive (about 40 minutes from South Charlotte), I would play this course all the time. For $39 bucks though you really can't beat it. We played at 9am and rolled through in about 4 hours, roughly. Fairways and boxes are all in great shape. Sand was fine as well. There's really nothing bad to say about the place other than the drive to get there. Andy's burgers afterwards is a must - I still claim they have the best Cheeseburger! 10/8/11, Review by ILL-INI - Even though I played like shart and the rest of my group played like shart, I can't take anything away from Red Bridge. Pace of play was as quick as we could go at 7:40am. We actually fell a little behind the 4-some in front of us and needed to speed up. Greens are so darn quick, I actually don't mind it because i would rather have fast and rolling true than medium speed and less than true roll. The greens are in such good shape it's remarkable what they've done with this course. And at $44 at the course or $39 on click it you really can't go wrong with playing this course. I would put this course on the "Hard" to "Very Hard" list and right up there with "Break a club, curse out loud, vow to give up golf" list as well. You have to be a shotmaker on this course or at least have very good course management skills. There are very few times the course will bail you out for hitting a bad shot. That said, it's still a fun course to play and if you appreciate how well they are keeping care of this course you will have a great day. After you play try that burger joint Andy's over there by McDonalds as you leave. Cheeseburgers there are like the old school diner type and man are they awesome. 10/8/11, Review by cmgbulldog - This was my first round at Red Bridge. I have to admit, even though I played horrible, this course is in awesome condition. The greens are some of the best, if not the best, around. I played in a four-some, two of whom had played the course before and two that have not and trust me, it plays no favor for knowing the layout of the course. It is full of difficult tee shots and approach shots and challenging putts. Definitely a golf course suited for the target golfer. All-in-all, I'd recommend anyone that hasn't played here give it a shot, it's a little ways out there, but well worth the drive. 10/4/11, Review by izzyf150 - I have to agree with the last few posts about this course. The course is in great shape and it is very difficult. I think the reason that the greens are in great shape is because it’s an accomplishment to be on the green in regulation. Lots of people chipping up to the green due to the difficulty of the course. I know I’m not a great golfer but I didn’t need to use my divot repair tool the whole round. One thing about the course that I personally didn’t like was that the course has five par 5's and five par 3's. I enjoy normal amount of par 4's on a course but like I said this was just a personal issue. Another thing I didn’t like was there was many holes that require about a 180 yd tee shot to carry a hazard and reach the fairway or green, and thats if you hit straight shots. Someone like me who struggles with slices a lot gets killed with the loss of distance and the fact that the hazard is further to carry if you don’t take the short way across. This course is for the confident golfer. 10/3/11, Review by Jova007200 - I wanted to make sure I took back my green comments. I played again today, twice. First round was all to myself; nobody was out there. I was the first one there. The greens were absolutely perfect. Veeeeeeeeery few blemishes, and the apparent dimples have either been cut out and pressed out. I scored horribly; dang this course is difficult! 10/1/11, Review by Orion - An absolute fantastic course. Never played on a course this well kept. The greens were tricky and fast, the tee-boxes were flat and soft, the beer was cold, and the hot dogs were tasty (although there was no chili). It's a bit out of the way, about half an hour from Monroe, but the drive is so worth it. The course is extremely long, and a few holes that really make you think about what club to play. I absolutely encourage everybody to check it out. 10/1/11, Review by Jova007200 - I have to say, this course is well designed. Great layout, and somewhat difficult. The fairways were in great shape. The rough did have some dead clippings. I'm surprised that they cut it and left it like that, but its no biggie. It was just in contrast with the overall beauty of the course. The greens were bloody fast like the other reviewer of the day posted. However, they did do some punching recently enough that the greens were a little perforated. That's why I didn't give it a 5 out of 5 stars. It just pissed me off when I tapped it on a good line and when it slowed down near the hole it wobbled around and stopped. It wasn't a big deal but these greens are somewhat difficult, and when they're fast you have to rely on those last few slow inches; otherwise too fast and it will roll on by. I wanted to take out a shotgun and blast the ball to pieces where it lie. That said, the greens were in excellent and pretty much unblemished shape for this late in the season. I am guessing they're using Mini-Verde; its a much firmer surface. To beginners that might stop by this site and read. Be ware that you have to place your tee shots well. The fairways deliver a lot of bounce upon receipt of the ball. Several of mine bounced right off of the bloody fairway. Definitely a more challenging course, and not for the feint of heart. As for my game, I started off great. Then I caught up to the groups in front and fell apart. I always do that. 9/16/11, Review by ctwheels - Greens were rolling nice. First time I played course and it was worth the drive. Pro game out introduced himself and gave me some pointers. A few blind holes that I did not care for other than that it was great course allot of fun. Greens were tricky and par 3's were fantastic. 9/7/11, Review by DrSchteeve - Not many times I can say perfect, but this was it. Greens, fairways, bunkers, teeboxes, rough. Nice layout. 3 hour pace. Wow. 9/4/11, Review by mondiablo - The course was in great shape. The greens are about 95% healed from being punched several weeks ago...little slow. New sand in the bunkers made for predictable bunker shots. Fairways were green and running. Driving range and practice green were in great shape. Except for a few quirky holes, definitely worth playing! 8/7/11, Review by DrSchteeve - Everything was really good. The new routing definitely improves the layout. They continue to take very good care of the course, the Bermuda greens fare very well this time of year, and at $39 just impossible to beat. 7/30/11, Review by El Supremo - I'll make this short and sweet. This course is on par with Edgewater and Springfield as far as conditions are concerned. Nearly perfect. Fix your ball marks. 7/23/11, Review by metallikviper - Pretty much a perfect course. Tee boxes great, fairways well manicured and greens almost perfect. Sand in bunkers wasn't as fluffy as you'd expect, but still a lot better than others. Only thing that bothered us was the 5 hour round. We had a 3-some in front of us who were held up by a slower 4-some and would have really appreciated if the marshal had asked them to move it along. If it wasn't so far away from Charlotte I would play it more often. 7/5/11, Review by tvrepairex - Good conditions-fairways have good coverage and greens in good condition except for #16 that still has a small issue on one side-This green for some reason always seems to be the one with issues.The greens looked good but seemed a little on the slow side compared to other times I have played here.I played as a single and saw few other players until the 17 th tee when I caught another single waiting on a foursome so pace of play was what I made it. 6/27/11, Review by esb - This course has undergone some major improvements over the past 10 weeks. Greens were excellent. Fairways were decent, especially considering that they were barren 10 weeks ago. Tee boxes and sand traps again were excellent. OVERALL GRADE: An excellent and VERY difficult test of golf skills. It's pretty easy to make a big # on many of these holes, as my 14 dogfight points and 100 score proved. My only gripe was the pace of play and the ranger on duty. Our foursome was held up on every hole on the front nine by a three some playing very slowly in front of us....not a big deal except for the "rednecks" that hit into us from behind on 6 of the 9 holes on the front nine. After hitting into us on the 8th hole once again, the rednecks caught our group as we waited to tee off on #9. We had previously advised the ranger of the problem and he assured us that he would take action. The ranger on duty was often seen, but did nothing of significance to earn his pay. Upon catching us on #9, he rednecks offered no appologies for consistently hitting into our group and actually became confrontational when one member of our group commented on their impatience. When we teed off on #9, the rednecks skipped the hole and we caught them on the #10 tee box....we let them go.....the world has bigger problems!!! But these guys were class A Jackoffs and the ranger on duty did NOTHING! 6/20/11, Review by BetterThanMost - Red Bridge was in good shape on Sunday. I saw only a few small bare spots on some of the more exposed greens, but for the most part, the greens rolled very true. Teeboxes and fairways were in good shape. Played as a twosome at 7:15am. Played through a foursome on the 3rd hole, and didn't catch another group until 18. 6/5/11, Review by Russell - Well, I was looking for an inexpensive round on a weekend a settled on Red Bridge. I figured from the coupons that they had aerated recently, and they had. Average amount of sand topdressing but still hard to keep putts on line. They have changed up the order of the holes. The first hole used to be a short par 3 - strange in my book. Now the front nine starts on a long par 4. Front nine still has 3 each of par 3, 4 and 5. Also strange. This change in the hole order also messes up sky caddie. Just a hint - start the sky caddie on hole 2 to get the correct distances for the first hole. I can understand both the good and bad earlier reviews. The fairways have always been on the harder side (good since you need the additional distance) and I have seen drives land in the middle of the fairway only to careen left or right into a fairway trap or woods. Also, many of the areas just off the fairways are rocky / weedy making recovery shots difficult. But, everything does seem to be greening up at the same pace as many other local courses and there are some memorable holes. Staff was friendly and the price was right - they even had a $29 rate before 7am. Dry and hard? Yes. Unique? OK. Inexpensive? Yup. 5/19/11, Review by dogleg - Negative reviews previously posted don't match up with my experience. Course is greening in great! Layout is scenic and calls for various shot-making skills. Good drives are rewarded and the greens are challenging albeit slower than you think. Considering this course is still relatively new, it is going to mature into a great course. And, the staff is just plain nice! 5/1/11, Review by esb - OK...let's start with the positive. Red Bridge is an ultra challenging course with some innovative holes. The par 5, 18th covers 619 yards from the white tees with the green protected by a creek in front and a severe slope. This course plays long and is certainly not for the beginner. A great challenge. So why the ONE STAR review? Despite it's potential, the fairways are barren, dry and hard as a rock. I would say they are the worst I have played in 2011. The greens? Again very poor. You will leave this course disappointed as the conditions blunt your enjoyment of a truly unique layout. This course has potential, but I do not see that potential being reached any time soon.